Often when we think about survival, we think about tools and techniques that can save our lives in the face of imminent danger. These are definitely important skills to keep in mind – but there is one more thing that is often overlooked and arguably more important than any survival gadget you own. It’s your survival mindset. Your brain – more specifically, your survival mindset is an amazing and dangerous tool all in one. Don’t believe me? Let’s take a closer look at just how important your mind is in survival situations. According to studies, 95% of people that perish from psychological trauma die within the first three days. Survival truly is a mind over matter situation. There are countless stories of untrained, unprepared people surviving insurmountable odds simply because they refused to give up; they refused to stop trying. The will to survive can trump firearms, knives, and survival training any day of the week. Almost as common as stories of unprepared people surviving horrible conditions are stories of well-prepared individuals who have specialized training that perish. They perish because they gave up their will to live, essentially they had the wrong survival mindset. 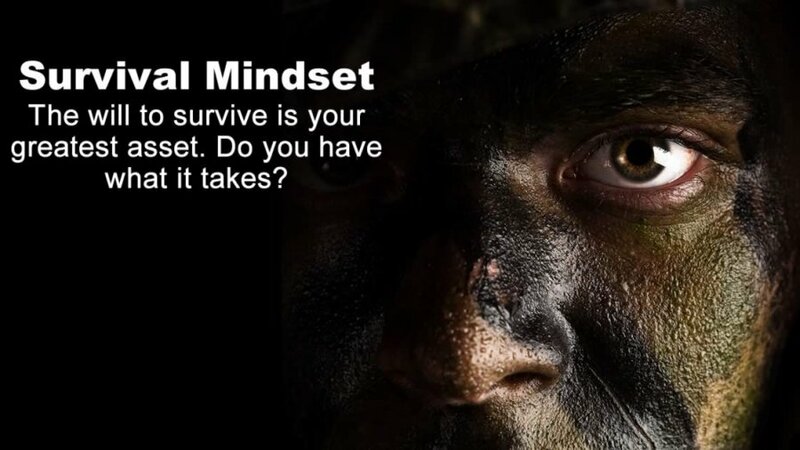 What is a Survival Mindset? Although we may be born with a will to survive, we can improve our survival mindset through training. The Navy SEALs are one of the most elite Special Forces units in the world; as many as 75% of prospective SEAL recruits fail to complete the intensive training program. The Navy wanted to find out why so many physically-capable candidates were failing and launched a research project for answers. Physical ability is not the issue. Intelligence is also not the issue as most SEAL candidates tend to score above average on IQ tests. Psychologists performing the study determined that the sole reason for failure was that the candidates were not mentally prepared for the emotional and psychological stress of training. As a result of the study, the Navy added psychological training to the SEAL curriculum and failure rates have been reduced drastically as a result. Let’s take a closer look at these tactics and how we can apply them in our own lives. We all know the importance of setting goals in life. They help us to achieve things we desire and give us a plan that we can follow to achieve these aspirations. In a crisis situation, goal setting is even more important. Short-term, midterm, and long-term goals are all important aspects of a proper survival mindset. Short-term goals – A short-term goal might be as simple as surviving the next five minutes during a dangerous situation. When the human brain is stressed, it’s easy to fall into patterns of illogical thinking and irrational behavior. By focusing on short-term, easily achievable goals, it becomes much easier to regain rational thought processes and remain positive in the face of extreme danger. Midterm goals – No, we are not talking about midterms in school. A midterm goal could be locating and securing shelter for the evening or finding food. Although time limits are not critical, a midterm goal might be an hour in the future. Normally, a midterm goal might be considered a 5 – 10 year plan; in a survival situation we have to think differently. Long-term goals – In this context, a long-term goal might just be surviving until tomorrow. When we think of long-term goals, we think of our overall plan for life or some major event in the distant future. In a survival situation, we must break this chain of thinking by creating easily achievable goals that keep our mindset in check. If you have ever been nervous before a big job interview or other important event and found yourself rehearsing in your head beforehand, you are familiar with visualization. Navy SEAL recruits learn this technique through a series of tests. For example, during underwater training week, recruits are required to perform various tasks underwater while relying on SCUBA gear to breathe. SEAL instructors will swim underwater and sabotage the recruits’ breathing apparatus. This immediately triggers a primal fear of drowning and often leaves recruits disoriented and unable to perform. To combat this, recruits are trained to visualize the successful completion of the exercise before they begin. Recruits who took the time to visualize the actions they would need to take underwater were much more likely to complete the tasks, even without oxygen. We can apply the same technique to any task that needs completion. Your chances of defending yourself, finding shelter, making a fire, or retreating to safety are all greatly improved by visualizing the exact steps you need to take before you even begin. That way, when something unexpected does occur (and it probably will), you are prepared and can focus on the remaining steps to complete your task. Did you know that people can talk to themselves as fast as 7,000 words per minute? That equates to 116 words per second! If most of those words are negative, self-doubt and hopelessness are almost guaranteed to take over. In order to maintain a survival mindset, you must rely on positive thinking. To manage self-talk effectively, you have to realize how often it occurs. You can practice this on your way to work in the morning. Everything from the car in front of you to preparing for a big meeting can result in negative thoughts that ultimately lead to stress. In a survival situation, these negative thoughts are even more dangerous and need to be avoided by any means necessary. Practice replacing negative thoughts with positive ones when they occur. Although this may sound like a lesson on positive living, the intention is to highlight the importance of training your brain now to manage negative thoughts as they occur. It will become second nature when you are depending on your mindset to survive. The Navy encourages recruits to use personal mantras that help maintain positive thinking patterns under pressure. Even a simple, one word mantra such as “survival” can help lift your spirits and keep you focused on surviving in the face of danger. Our bodies are programmed to react in stressful situations. The bloodstream is flooded with chemicals such as adrenaline that increase physical ability. These same chemicals make the body very reactive and years of physical and mental training can be lost in an instant. SEAL recruits are taught to focus on breathing. This helps to temporarily divert their attention away from stressful situations and allows the brain to stabilize. A stable brain is a logical brain and a logical brain can take advantage of the physical performance gains afforded by increased hormone levels. Controlled breathing is not difficult. Focus on breathing into your nose and out through your mouth; exhaling more deeply than you inhale. This helps to remove as much carbon dioxide as possible from your lungs while refilling them with fresh oxygen. No matter how dire the situation may seem, focus on nothing other than your breathing. If your mind begins to wander, gently redirect your focus back to your breathing. After a couple of minutes, you can reevaluate the situation and be confident that you are not making irrational decisions based on fear or anxiety. A similar breathing technique is used in meditation practices because it has the same calming effect on the body. You can practice this any time you feel burdened with stress at home. Just a couple of minutes of deep breathing are all it takes to regain composure in most circumstances. After 24 hours of continuously being awake, SEAL recruits often fall into small bursts of micro sleep. This behavior is involuntary and may last only one or two seconds, but can leave the recruit feeling disoriented and adversely affect performance. In another Navy study, SEAL candidates showed significant deviations in performance after 72 hours without sleep. Shooting accuracy decreased by almost 40%. This marked decrease in shooting accuracy means that a Navy SEAL is no more effective with a gun than a civilian without proper training. In stressful situations, sleep may be the last thing on your mind. However, it is necessary to get at leastsmall amounts of sleep whenever possible. Even power naps of 20 – 30 minutes can significantly reduce the effects of sleep deprivation. If you are in a group, try to alternate sleep cycles with other members of the group. This ensures that someone is always sufficiently rested and capable of making important decisions for the group quickly. Learning to control your emotions and forming an overall survival mindset is a skill that takes a long time to master. Our brains are truly amazing and capable of adapting to almost any set of circumstances. Your mind can be either your biggest asset or your biggest liability – depending on how you use it. By understanding the principles of a proper survival mindset and taking steps to ensure your mental stability under pressure, you will be well on your way to having the same calm, collected persona that is often associated with some of the best trained soldiers in the world. A proper mindset is the difference between a survivor and an unfortunate casualty. Next: Off-Grid Living: The Next Big Thing for Survivalists?